Wi-Fi free parking and an outdoor pool are among the amenities our guests appreciate at Clarion Inn & Suites Savannah. Clarion Inn has 120 rooms occupying two floors. 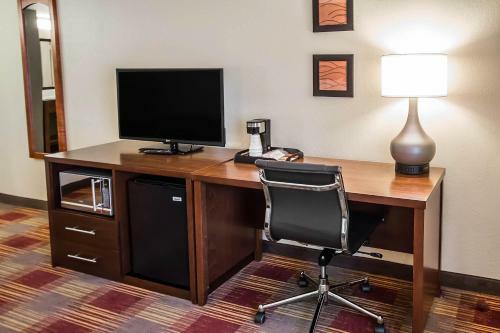 High-speed internet and contemporary furnishings are featured in all accommodations. Suites are also available. Each morning's continental breakfast is on the house and there's a seasonal outdoor pool on the premises. Parking is free. Located one mile from Hunter Army Airfield and four miles from the historic heart of Savannah Clarion Inn & Suites is within walking distance of a handful of restaurants and one mile from a large shopping mall. Drive five minutes to two golf courses or four miles east to the gardens at Wormsloe Plantation. Savannah/Hilton Head International Airport is 14 miles from the hotel. Add Clarion Inn & Suites Savannah to your free online travel itinerary.